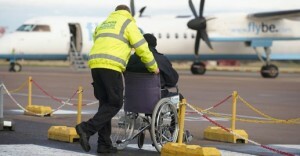 Our friendly wheelchair accessible transport service is an excellent choice for an Airport Shuttle & Special Events. If you need a scheduled pick up to or from Reagan National Airport, Dulles Airport, or BWI Airport our specially equipped vans can get you there safe and on time, without you having to get out of your wheelchair. We also provide reliable wheelchair accessible transportation for special events such as weddings, birthdays, religious service, and various other occasions. Scheduling is easy, call one of our friendly representatives at 301-530-5566 to schedule your pick up.